The Village Library and Reading Room Association of Newfield was organized in 1886 and is a nonprofit membership organization. The library is now located at the west end of the Selectman's Office building at Water Street Newfield, Maine. 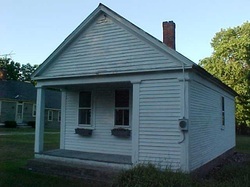 The first meeting of The Village Library and Reading Room Association of Newfield, Maine was held on March 25, 1886, in the Free Will Baptist Church Meeting House. It was at that meeting it was decided to elect officers and vote for three trustees to represent the association. It was also decided to appoint two committees a book selecting committee and a committee to draft a constitution and by-laws for the association. On May 9,1888, Dr. Isaac Trafton presided at the first regular meeting. A room committee of three was appointed on May 1, 1889 to look into acquiring Judge Nathan Clifford's law office on Elm Street. The building and the 18' x 47' lot was purchased from a donation for one hundred and fifty dollars. The building was opened more in the evenings than in the daytime and a small wood-stove kept it warm.